Warm weather vacations are the best kind of vacations mainly because it’s so much easier to pack. Summer clothes are lighter and easier than winter clothes, so you get to bring along a slew of more options! And I’m an options girl. I’m also the most meticulous suitcase packer within my household. Equipped with usually two extensive lists, I’ll start packing at least a day before to give myself plenty of time to think of everything I could possibly need to bring along. At times I wish I was the ‘throw whatever into the suitcase and deal with it later’ person. The key to a solid travel wardrobe are three things: simplicity, versatility and quality. You’ll want to be able to swap out pieces and mix and match to create twice as many outfits without having to actually pack twice as much. Since I’m already such a fan of The White Company (they seriously make everything you’ll ever need), I thought it was as good a time as any to test out their products against my travel wardrobe guidelines. The White Company is a British lifestyle brand that recently crossed the pond, opening their first store in New York. Simplicity: Just because something is simple, doesn’t mean it has to be boring. Packing pieces that have clean lines, fit well and look chic will always guarantee you look effortlessly put together, regardless of how much time you actually spent getting ready. A fitted white t-shirt is a staple in my suitcase. This white peplum camisole has ‘summer ease’ written all over it and I’m always on the hunt for tanks of this style that are more modest up top. Since I’m constantly with a baby on my hip, a higher neckline is smart to combat the pull down that happens when you’re lugging a human on your body! Versatility: I try to exclusively pack things that can either be a daytime outfit or an evening outfit. This can be based on how you pair them and your chosen accessories. This tassel scarf is a great example of a day-to-night transition piece. A chic and neutral bag means no clashing scares, and I also like to keep all my clothes within a monochromatic color palette (not surprising, I know), so then everything goes with everything! Quality: No one wants to arrive to their hotel room only to spend the next hour ironing all of your clothes back to their crisp original selves. You can tell a quality piece of clothing by how it stands up to being folded and cramped for a number of hours. Especially during the summer, all linen pieces are your best options! If you ever want to be super meticulous, I sometimes suggest trying on outfits before you pack them and taking pictures of yourself in the outfits. Then when you don’t know why the heck you packed that one skirt or what on earth you’re supposed to wear with that particular pair of pants, then you can swipe through your pictures and have full references for your entire travel wardrobe. This may make me sound crazy, but I swear it saves time and energy so you can enjoy your trip and not overthink your wardrobe. 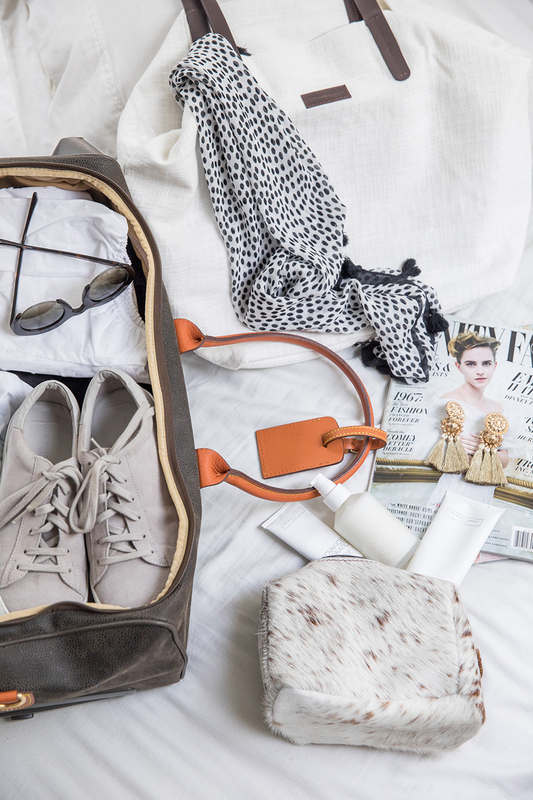 What are your packing tips for your summer vacations? And where are you going this August?